On circumlocution. Example from science journalism: Nature Magazine. Genome editing is creeping out of science-fiction into real life, and the question is who owns the rights to a breakthrough. The CRISPR technology is particularly promising and lucrative, and has led to a legal fight for the patent between MIT and Harvard’s joint venture, Broad Institute, and the University of California, Berkeley. The Quote comes from a recent article in Nature Magazine. Quote: Although that battle is over, the war rages on. Berkeley has already appealed against the decision; meanwhile, the European Patent Office has ruled in favour of Doudna and Berkeley. Doubtless there are many more patents to milk out of this versatile system. And then there’s the fistful of 66-millimetre gold medals they give out in Stockholm each year. Why is that last sentence so long? Why didn’t the author just say: And then there’s the Nobel Prize? A mini puzzle to make the readers feel in-the-know once they’ve worked it out. And then there’s the Stockholm gold. And then there’s the 66-millimetre gold. Miscommunication would make the readers feel excluded, which is the exact opposite of the intended effect. But why bother with a roundabout statement at all and risk alienating readers? Saying And then there’s the Nobel Prize would have left less to smile about and less to be imagined about potentially shallow, prize-driven motives. (This way humour lightens the mood.) As it stands, the Quote is not a euphemism for Nobel prize but it does euphemise the cutthroat environment of science research. Although that battle is over, the war rages on: a cliché that quickly conveys how the situation is perceived; more acceptable in journalism than in creative writing. many more patents to milk out of this versatile system: did you imagine something distinctly non-cow-shaped being squeezed for milk? The verb to milk, as in cows, has been around for a few hundred years more (possibly dating back to Old English c. 1000) than the metaphorical sense to extract gain from a situation, which arose in the sixteenth century. This doesn’t justify visualising udders attached to lab equipment, but when imagination runs riot, you let it. Aposiopesis is a figure where the speaker or writer stops mid-sentence as if unwilling or unable to continue. In writing it’s often marked by an ellipses. In the Quote, however, it’s found in the form of a seemingly uninformative statement, And then there’s, which leaves the reader to complete it as appropriate: and then there’s X, which is worth fighting for; and then there’s Y, which is a big problem, etc. Context is king and decrees the completion. 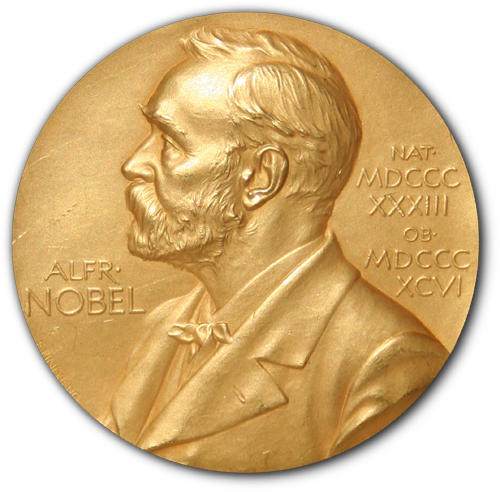 Given the topic of high-powered research and the relatively known fact that Noble Prizes are awarded in Stockholm (in the form of medals and diplomas and money), the current phrasing of the Quote allows the target audience to work out the reference at reading speed and feel good about doing so. The Quote also teaches: I don’t think I’ll be forgetting any time soon that the Nobel Prize medals have a diameter of 66 millimetres. Apple’s Metalepsis, QQ. Discusses Apple’s tagline for their new mobile operating system. Opium Meets Classical Readers, QQ. An example of how proverbs compress meaning by using periphrasis or metonymy. I didn’t know they were 66mm gold. I figured it out, but learned something along the way. As well as enjoying the view of the windy road and the look on that cow’s face! Oh and random observation: for a moment I couldn’t tell whether you meant windy (windswept) or windy (undulating). Interesting homographs because their stems, usually a noun for moving air and the verb for twisting, are harder to confuse even though their also both spelled the same, namely, ‘wind’. Good catch – didn’t spot the alter ego of that sentence!